Morgan James Faith, 9781683501336, 216pp. Award-winning entrepreneur and author Connie Rankin wrote this inspirational book to share the wisdom and experience of 10 amazing women. 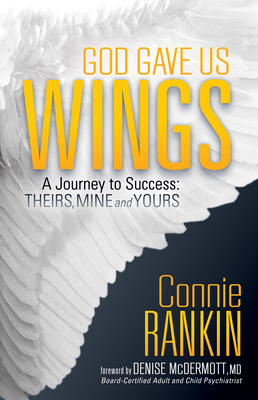 God Gave Us Wings features incredible true stories which sometimes begin to spin out of control, from Oprah's personal journey to a wounded warrior's battle to survive. These women faced monumental life challenges. In spite of enormous trials, they found the secret to living victoriously -- they drew on their faith, courage, resiliency, and strength, discovered their wings and have taken flight. Their remarkable stories were written as a catalyst to empower female readers and propel them toward success. The women in this book have boldly defined their words for success. Their achievements demonstrate that no matter what your circumstances, you can rise higher than you ever imagined. Connie Rankin, Author, and CEO of an award-winning commercial real estate company in Houston, Texas. Connie's passion is mentoring women, entrepreneurs, leaders and people just starting out on how to achieve success. She has transcended her childhood of life-threatening injury, sudden poverty, and even being homeless to now one of success. She has received numerous awards that include the Women of Influence by the National Real Estate Forum, Business Star, Women Business Enterprise Advocate by the Women's Business Enterprise National Council, and the Fastest-Growing Women-Owned Businesses by the Houston Business Journal. She has appeared on Fox 26 News, on the cover of Business Today magazine, and a contributing writer for Huffington Post.